Nuclear activities in the Arctic over the last 50 years. Numerous nuclear explosions have taken place in the Arctic. One of the largest military nuclear testing facilities is on the island of Novaya Zemlya, where from 1955 through to 1990 the Soviet Union detonated 88 atmospheric, 29 underground, and 3 underwater nuclear devices. Dozens of civilian 'peaceful nuclear explosions' have also occured in the Russian Arctic, where nuclear bombs were used into the late 1980's for seismic studies, mining, and in attempts to extinguish oil-field fires. It'll be hard to clean up if there's an oil spill in Arctic waters: Concerns voiced about ability to handle spills in ice (Dan Joling, Anchorage Daily News, April 12). 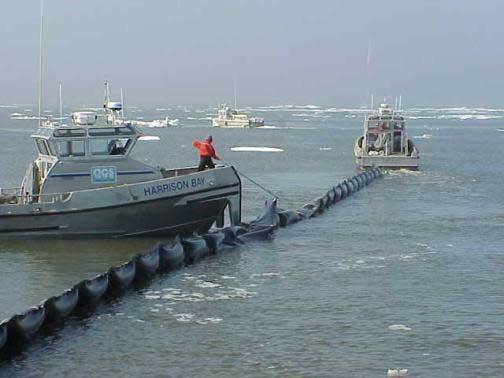 The photo above shows a 2000 oil spill response exercise in Alaska's Beaufort Sea. Are Ribbon Seals Threatened or Endangered? Ribbon seals are "charismatic megafauna." The National Marine Fisheries Service (NMFS) has agreed that a petition from the Center for Biological Diversity to list ribbon seals as threatened or endangered provided enough information to justify a more detailed investigation. 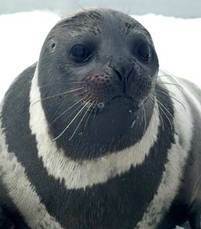 The ribbon seal faces likely global extinction in the wild by the end of this century due toglobal warming which is resulting in the rapid melt of this species’ sea-ice habitat. Sea icerepresents the only substrate where ribbon seals rest, give birth, nurse their pups, and molt and where weaned pups rest as they learn aquatic proficiency and foraging skills. In addition to providing habitat for critical life cycle activities (reproduction, molting, resting), sea ice provides numerous other important functions for the ribbon seal, including isolation from polar bears and terrestrial predators, greater proximity to food resources, and passive transport to new feeding areas.